Agilent Technologies Inc. (NYSE: A) recently announced the availability of real-time spectrum analysis (RTSA) for its PXA X-Series signal analyzers. Agilent's RTSA delivers unmatched probability of intercept (POI), analysis bandwidth, sensitivity, and frequency range-capabilities that make it the best way for system developers and signal analysts to see, capture and understand highly elusive signals. In applications such as radar, electronic warfare and military communications, POI is the key benchmark for RTSA. When configured for real-time spectrum analysis, the PXA can detect intermittent signals with durations as short as 3.57 µs, which is the best POI currently available. "Even at the extremes of signal analysis, a high-performance analyzer should be ready for anything-and that's why RTSA is an upgrade option to the PXA," said Guy Séné, president of Agilent's Electronic Measurement Group. 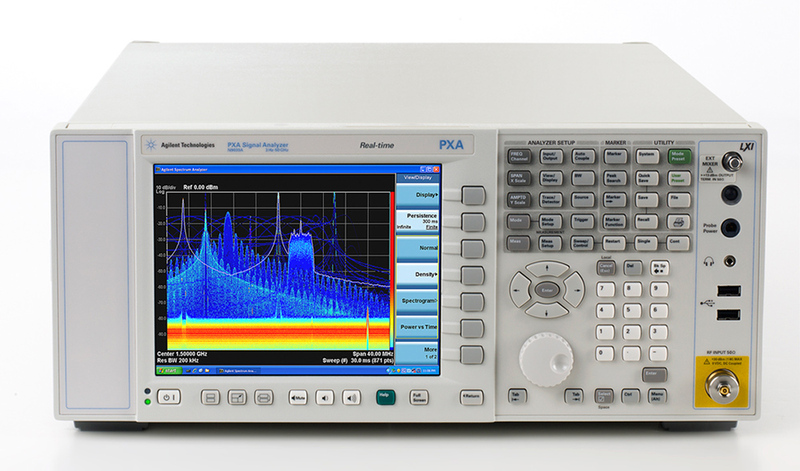 "Only the real-time PXA combines a high-performance signal analyzer and real-time analysis. It gives users greater confidence that they've achieved a detailed understanding of what's happening inside a signal-rich system or environment." To help detect more signals in less time, Agilent's real-time PXA provides an industry-leading 75-dB spurious-free dynamic range across analysis bandwidths of up to 160 MHz. This enables users to place deep and wide measurements anywhere within a measurement range of 50 GHz. In addition to its industry-leading sensitivity of -157 dBm at 10 GHz (no preamp), the PXA also provides the ability to vary the resolution bandwidth within a measurement span. With this combination of capabilities, users are better able to resolve closely spaced signals, identify intermittent low-level signals and further improve POI. For deeper analysis and thorough characterization of complex signals, a real-time PXA seamlessly integrates with Agilent 89600 VSA software. This combination of capabilities enables users to find the root cause of signal problems with advanced troubleshooting tools that support measurements in the time, frequency and modulation domains. The software also provides connections to Agilent instruments such as vector signal generators and arbitrary waveform generators to play back captured signals as inputs to a device under test. N9030AK-RT1 real-time spectrum analyzer up to 85-MHz bandwidth: $7,224. N9030AK-RT2 real-time spectrum analyzer up to 160-MHz bandwidth: $10,320. The starting price for a new N9030A PXA signal analyzer with the real-time spectrum analyzer option up to 160 MHz bandwidth is $96,304. More information is available at www.agilent.com/find/real-timePXA. High-resolution images are available atwww.agilent.com/find/real-timePXA_images. A media backgrounder is available at www.agilent.com/find/real-timePXA_backgrounder.